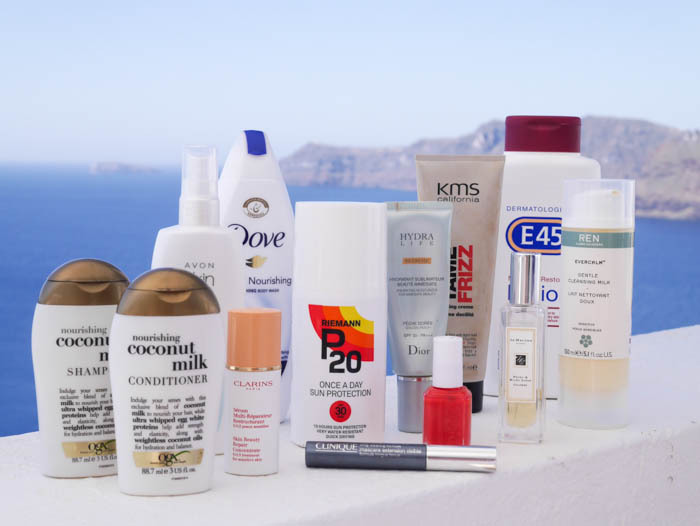 I probably use more beauty and skincare products when i’m on holiday than I do any other time of the year, and there are certain products that I go to year after year. 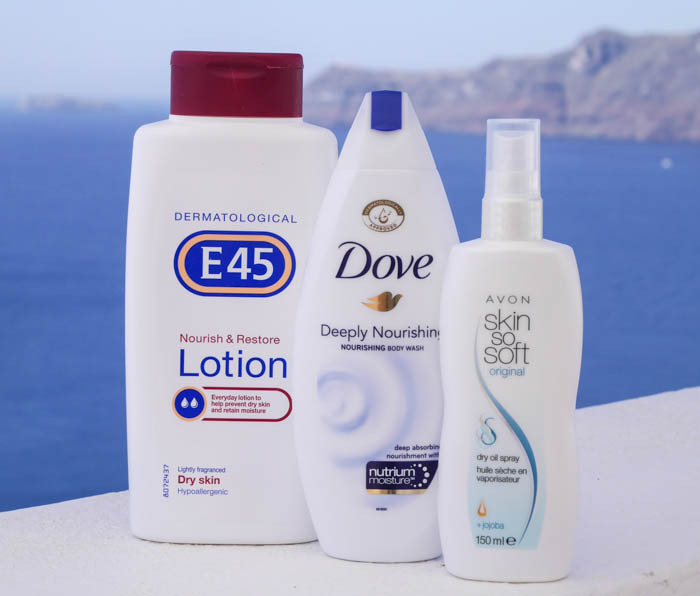 Here are my top beauty products that I can’t live without on a summer holiday. Frizz control – I am prone to a bit of crazy hair anyway, but add some heat and moisture and it is always interesting. This KMS Tame Frizz helps keep things in control. It is humidity resistant and doesn’t weigh your hair down. Nourishing shampoo and conditioner – goes without saying. At home sometimes I’ll use a volumising shampoo, but when subjecting my hair to pool water, sea water, sun and daily washing I want something as nourishing as possible to prevent it drying out. Preferably with a coconut smell which to me is the epitome of a summer holiday. This OGX Coconut Milk Shampoo and conditioner is perfect and it is a bonus that it is sulphate free. On a side note, these little bottles are so handy for a week or so abroad. Less weight = more room to bring goodies back home with you! P20 – This stuff is my fail safe. Slop it on once in the morning and you don’t need to worry for the rest of the day as it is waterproof and sweat proof. I have never burnt with this stuff and whilst you won’t get mega brown, you’ll develop a slow, steady, hopefully safe tan. It is now available in different SPF strengths, and also with a spray pump for easy application. Garnier Ambre Solaire Golden Protect – I forgot to picture this but it is lovely. 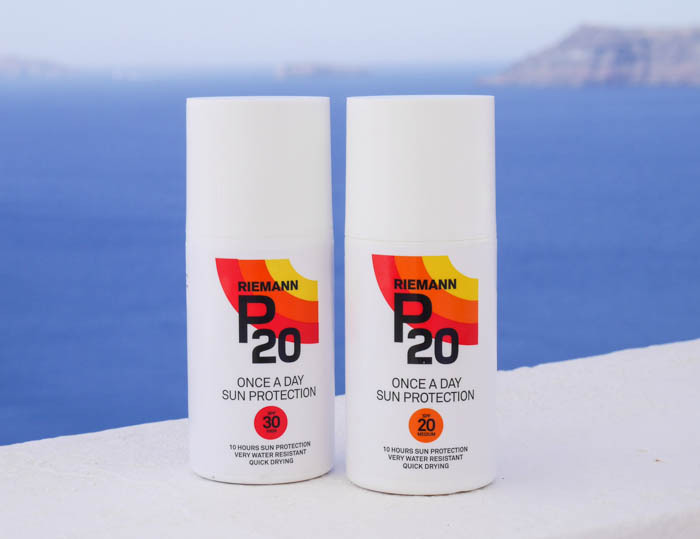 Although you don’t need it if you are using P20, sometimes if I am not spending the whole day in the sun, or have spent all day under water and feel like I need an SPF top-up to ease my nerves (I am incredibly anti-burn), this is my favourite. It has a shimmer to it that I would normally hate, but I am a big fan of that golden hour on the beach or by the pool and having this on during that time is magic. You know the scene; when everyone else has left the beach but it is still warm and the sun is low and the light is amazing. You look browner than you ever have and this cream will take you from regular person to Victoria Secrets Angel. OK, so that might be the gin and tonic or cocktail that normally accompanies the golden beach hour, but this stuff really does help too. Sorry I didn’t take a picture but you can buy it from just about anywhere – I normally get it from Boots. Gentle facial cleanser – Like my hair, when i’m subjecting my skin to so much during a summer holiday, I like to be extra gentle with it and give it some care. 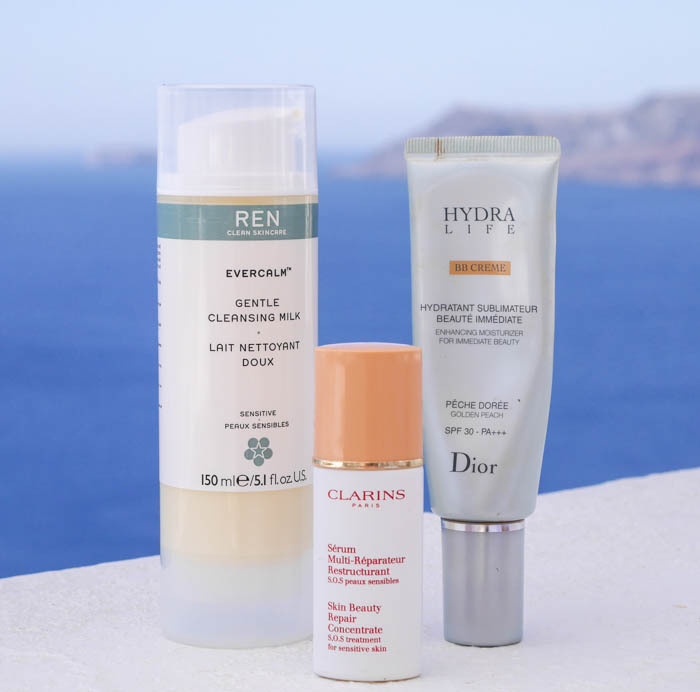 This REN Evercalm Gentle Cleansing Milk is really gentle on the skin and won’t irritate it after a day in the sea and sun. It is also pretty good value. BB or CC cream with SPF in – I actually wear a BB or CC cream (or just a regular tinted moisturiser) everyday instead of foundation as I like a light coverage, and the ones I use normally have SPF already in them. Not only does this mean I am protected on a day to day basis, but it is really useful on a holiday when I spend much more time in the sun than I normally would at home. I like this Dior Hydra Life one and also currently have the La Roche Posay CC Creme too. Moisturiser – I discovered this E45 Nourish and Restore Lotion this year and I can’t believe it took me so long. It is really good at moisturising dry skin without feeling heavy, or causing irritation. Doesn’t hurt that it is less than £5 for a huge bottle either. Bodywash – This Dove Deeply Nourishing Body Wash has been a holiday favourite of mine for years and years. I love the smell, it is very nourishing and feels like a treat for my body. Anti-mosquito – Yes, you heard right. The Avon Skin So Soft Dry Oil Spray for reasons unbeknown to myself, is the perfect mosquito repellent! And the real bonus is it doesn’t smell bad, and doesn’t melt your flip flops like the regular anti-mosquito stuff does. Also, as it is a dry oil it will give you some additional moisture and dries very quickly. If you don’t have an Avon Lady, you can buy it on Amazon here. Summer scent – I like something nice and light in the summer, and am in love with Jo Malone’s Peony and Blush Suede. Tubular mascara – Another one I use everyday that is perfect for a summer holiday. Tubing mascara forms a tube around your lashes making them look longer. It only comes off with warm water, and it won’t smudge or flake all day even if you cry, rub your eyes (yes, I am very guilty of this), go for a swim etc etc I use this Clinique Lash Power Mascara. 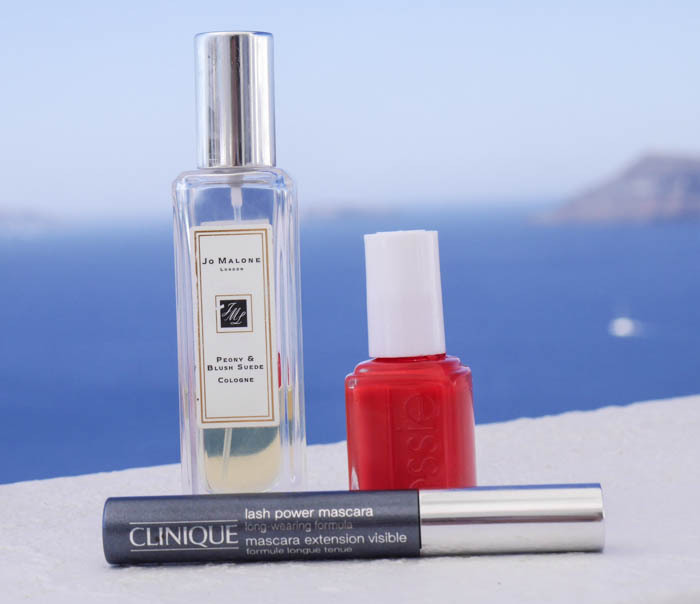 A bright nail varnish – there is nothing better than a bright toe or fingernail on the beach! If I haven’t had time to get a gel mani and pedi done before I leave I take a nail polish with me to top up. Sun, sun cream, insect repellent, water, chlorine and salt has a habit of melting nail polish off my nails, so something to top up with is always handy. This Essie Nail Polish in Canyon Coral was on both my toes and nails all this holiday. I obviously use other things such as moisturiser on my face, other skincare etc but these are just a round up of some great essentials. Do you have any good essentials I should add to my list?